There is no need to wait for spring migration to enjoy birding. With the right preparation and expectations, winter can be your very best birding season. Many people mistakenly believe that all birds migrate south for the winter, but in fact a lot of local birds stay put year round – woodpeckers, nuthatches, chickadees, cardinals, bluebirds and many other birds are year-round residents. Many northern birds – redpolls, crossbills, waxwings, snow buntings, juncos, etc. – are easier to see in winter because they leave their isolated boreal habitats and appear in more backyards and local refuges. Even spectacular tundra species, such as ivory gulls and snowy owls, make winter appearances further south, much to the delight of birders. And of course, there is always the possibility of a rare vagrant, some bird that strays well out of its typical range and makes birding headlines. Dress for cold temperatures by wearing thermal layers, and consider boot or pocket warmers for long birding hikes in very cold regions. Comfortable winter boots should be tall enough for trail use and should have good tread for solid footing on icy surfaces. Gloves should be thin enough so binoculars and field guides can still be easily used, or fingerless gloves with mitten covers are a great choice. Carry along a thermos filled with a warm drink and you'll be set for a great birding hike no matter how cold it gets. Birds are easiest to see in a place that meets their needs for food, water and shelter. Areas with fruit trees or seed-bearing flowers that still hold autumn produce are ideal, and any slow-moving river or marshy area that still has open water might be home to a variety of winter waterfowl. 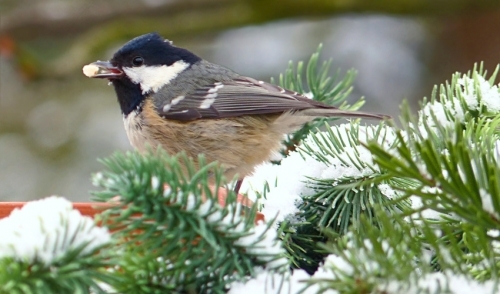 Forests with evergreen trees and conifers are also productive winter hotspots because of the thick shelter they provide for birds that eat the cone seeds. Of course, always choose birding locations that have safe trails and good winter accessibility as well. There are many citizen science projects for birders to join in the winter, including the Christmas Bird Count, Project FeederWatch and the Great Backyard Bird Count. Contact a local birding club or Audubon chapter for upcoming events and scheduled hikes to local winter hotspots, and join the group for some spectacular winter birding. This is also a great way to learn about other local birding destinations that will be easy to revisit when spring arrives. Some of the very best winter birding can happen right in your backyard. Fill your feeders with high-calorie treats such as suet, nuts and sunflower seeds, heat up your bird bath to keep the water liquid and put out the old Christmas tree for instant winter shelter, and you'll be amazed at how many birds take advantage of your yard. Sprinkle some seed under a patio table or deck and leave bird houses up for overnight roosts and even more birds will visit all winter long. Winter birding may not have the same bright colors as spring warblers, the buzzing intimacy of summer hummingbirds or even the fantastic flocks of fall migration, but it's a season no dedicated birder will want to miss. The more you take advantage of great winter birding, the more you'll come to see the coldest season as the hottest one for birding.